Denver’s apartment boom shows no signs of slowing down. 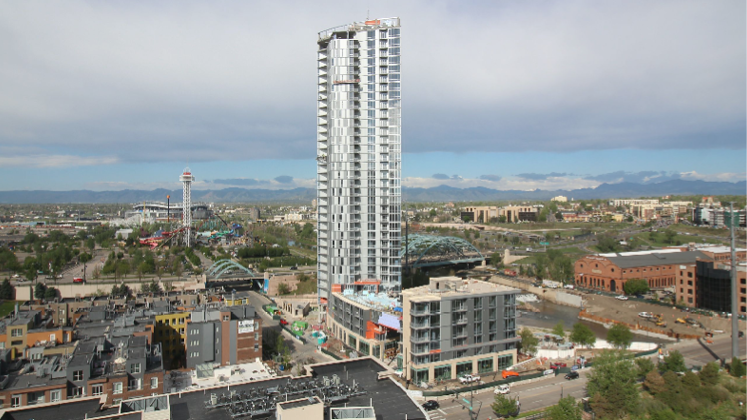 More than 25,000 apartments are under construction in the Denver area right now, Colorado Public Radio reports, most of them slated as rentals, and plans are underway for nearly 27,000 more. 13,142 new apartments will be complete in Denver by the end of 2017, an 18 percent increase from last year according to Denver 7 News. Furthermore, In 2005, near the height of the housing bubble, just 10% of new construction permits went to multifamily units in Colorado, while in 2014, that number was 38%. Residential construction starts in the Denver-Aurora area, which mainly consist of apartments, have increased from $2.9 billion in 2013 to nearly $4.8 billion in 2016, according to Dodge Data & Analytics. The experts predicted that new apartment construction would level off some time ago, but it hasn’t yet. Last year, developers built nearly 10,000 new apartment units in Denver — the largest number in the city’s history. In 2010, they built just 500. The first quarter of 2017 saw a record-breaking number of units completed: 3,246, the highest quarterly number by far in almost 15 years, according to the Apartment Association of Metro Denver. It also saw more units leased than completed and a vacancy rate of just 5.7%, the Denver Business Journal reports. What’s causing Denver’s continuing apartment boom, and is there any end in sight? In May, the inventory of active single-family home listings was down 28.7% compared with the same time last year. For condos, inventory was down 16.9%. Total single-family homes available for sale was just 756, while total condos available for sale was just 722 (DMAR, Local Market Update for May 2017). Low inventory is helping to push up home prices. The average home in Denver costs nearly $450,000, according to the Denver Metro Association of Realtors, which means a $1,933 monthly payment on a 30-year mortgage with a 4% interest rate and a 10% down payment (Bankrate mortgage calculator). That monthly sum doesn’t include homeowners insurance or property taxes. The city’s median home sale price was $382,475, which means a still-high $1,643 monthly payment. Between the down payment, closing costs and monthly expenses associated with buying and owning a house, home ownership is beyond many households’ reach in Denver right now. Yet Denver apartments remain some of the most affordable among cities nationwide. The city’s median rent for a one-bedroom apartment is $1,040; for a two-bedroom, the cost is $1,310. Across the metro area, two-bedroom rents are lowest in Denver, Arvada and Englewood, and highest in Lone Tree, Thornton, and Littleton. Golden has experienced the fastest rent growth over the last year. Denver’s pricing is on par with cities like Austin and Portland, and is only about 12% or $160 per month higher than the national average. The average rent for a new Denver apartment is $1,729, but 40- to 50-year-old apartments can be had for an average of $1,079. Apartments are so in demand in urban Denver that older single-family homes and duplexes have been torn down and apartments built in their place. About 17% of Denver’s population live in apartments versus about 12% of the population nationwide, according to WeAreApartments.org. And the Denver metro area has nearly 473,000 apartment dwellers occupying about 240,000 apartment units. For lifestyle and financial reasons, many people prefer renting an apartment over buying a home. Some of these reasons might be more applicable to Denver than to other cities. Since 2010, Denver has had the second-fastest-growing population in the country after Austin, according to the U.S. Census Bureau, with about 1,000 people per month currently moving into town. Newcomers to town don’t always want to buy right away. Renting can be a good way to get a lay of the land and a feel for which neighborhoods are the most attractive. It’s an inexpensive way to test the waters while thinking about more permanent options and making sure the city is a good fit. Demand from millennials is also contributing to the apartment construction boom, according to the Maryland-based real estate group Bozzuto. Young households need the flexibility to move where the jobs are, to live near trendy stores and restaurants in urban neighborhoods, and often don’t have the savings to buy yet because the recession derailed their careers. Buying a home usually requires thousands of dollars in cash for a down payment and closing costs. Moving into apartments in Denver only requires a security deposit and the first month’s rent. Home ownership comes with ongoing maintenance, and utility costs may be higher since the typical home is larger than the typical apartment. Homeowners may also be responsible for association fees; renters are not. Baby boomers are also driving demand for rentals because of their sheer numbers even though they generally prefer to own rather than rent. Supply can hardly keep pace with demand, which is pushing rental prices up. Denver’s rents overall increased by 0.9% in June compared with May, and prices are 1.7% higher now than they were this time last year, according to the June 2017 Denver Rent Report from Apartment List. With Denver’s rent inflation and older apartment stock, owning a brand new apartment building can be an attractive opportunity to make money. A survey by the Apartment Association of Metro Denver found that average rent for apartments built since 2010 are 60% higher than average rent on apartments built in the 1970s. These newer apartments are geared toward more affluent renters. Renters shouldn’t assume a new apartment is out of reach, though. Landlords, eager to fill their new properties quickly, may offer significant discounts on the first year’s rent. Landlords in areas with higher vacancy rates, such as downtown Denver, might also be more open to negotiation. Denver’s FasTracks Transit Project, a massive public transit expansion program started in 2005, has contributed to apartment growth in Denver, too, as developers have looked to cater to people interested in living near the new rail lines. The apartments Denver boom offers relief for those struggling to find affordable housing in Denver. It also offers opportunity for landlords and property managers. The first quarter of 2017 showed promising signs for continuing strong apartment demand this year. If you need help selling your home or finding a place to live, contact Usaj Realty for more information about how you can be one of the first residents of one of the many apartment units coming onto the Denver market in the near future or how we can help you find a great property.